Hard modes in video games, do you jump to the highest difficulty on your first play through the game? I know some people that have done that. Personally, I play the game on normal for my first time through. However, if after beating it I feel that the game deserves more of my time, for one reason or another, then I’ll likely try a harder difficulty at that point. Honestly though, if trophies weren’t involved, I’m not sure I would bother more often than not. There’s just something about having proof attached to your account that you finished something. Axiom Verge hard mode is something that’s unlockable right from the start, but I opted to go through on normal for my first time. I died 31 times my first time through the game, so the end stats screen showcased. So the game was plenty difficult, especially when you reach new areas filled with new enemy types. Once you get the patterns down, and figure out which gun work best, it’s not so bad. I found that on normal, it was actually the perfect difficulty. Sans the final boss, which was easier than I had hoped. In hard mode, the game ramps up the difficulty quite significantly. The enemies deal an increased amount of damage, and I think that’s what I notice more than anything. On my first time through, I didn’t really need to worry too much about dodging every projectile, or using the environment to my advantage all that much. On hard mode however, it’s a necessity. Though the bosses are mostly pushovers I’m noticing, it’s the masses of regular baddies that tend to murder me quite often. I find I use my disruptor weapon on the enemies a lot more than I did on my normal play-through. Oftentimes I’m low on health and some enemies change their behavior so radically that they produce health. I’m finding this essential to my survival so far. 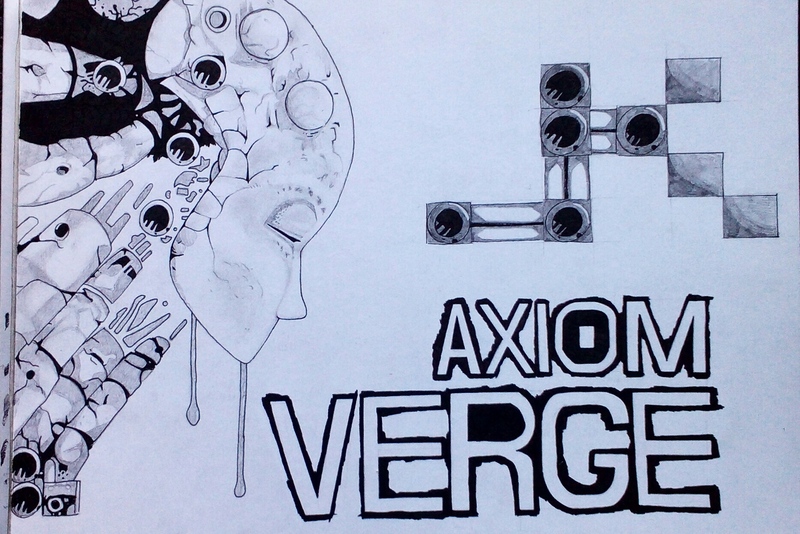 Oh yeah, about the Axiom Verge fan art I’m making up there; I think it’s coming along nicely. All I have left to do is edit those dripping bits a little because they are supposed to have a second section hanging down underneath, color the “Axiom Verge” title, and continue inking that entire background. Thanks, it’s taking a long time to do this ink! 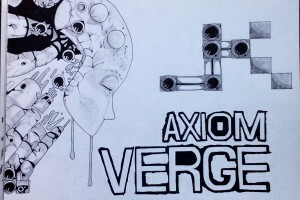 Yeah, I would like to do some more Axiom Verge related stuff after this one is done.